The number of sales in the past 10 years was highest in 2005 with 290 sales. The lowest number of sales was 123 in 2008. The number of sales has been in the range of 145 -160 sales per year from 2009 - 2014. The average number of days on market (DOM) was 69 days in 2004. As the market weakened in 2007 - 2009 the average DOM increased to 107. As inventory has decreased, days on market has steadily decreased, reaching a low of 41 days in 2014. Sale prices relative to list prices stayed in the 96% - 98% range from 2004 - 2012. As demand increased in 2013 the ratio increased to 101%. As inventory declined in 2014 the ratio jumped to an unprecedented 104% in 2014. The number of units on the market was 60 in 2004. The number of units on the market peaked in 2006 at 150. The number of units on the market has steadily declined from 2007 - 2014. On June 10, 2014 there were only 19 units on the market. 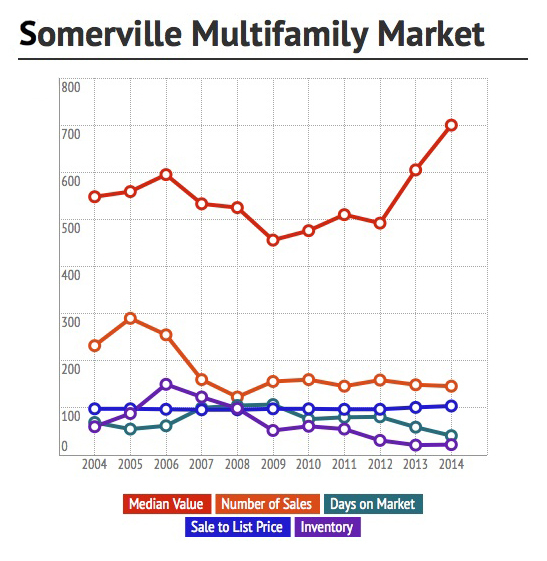 The multifamily market has been in an appreciating cycle since 2009. The current market is a seller's market with historically low inventory levels. As in Cambridge, demand is exceeding supply with multiple (often cash, no contingencies) offers significantly over asking price occurring frequently.